Online registration has closed you can still register at the door. 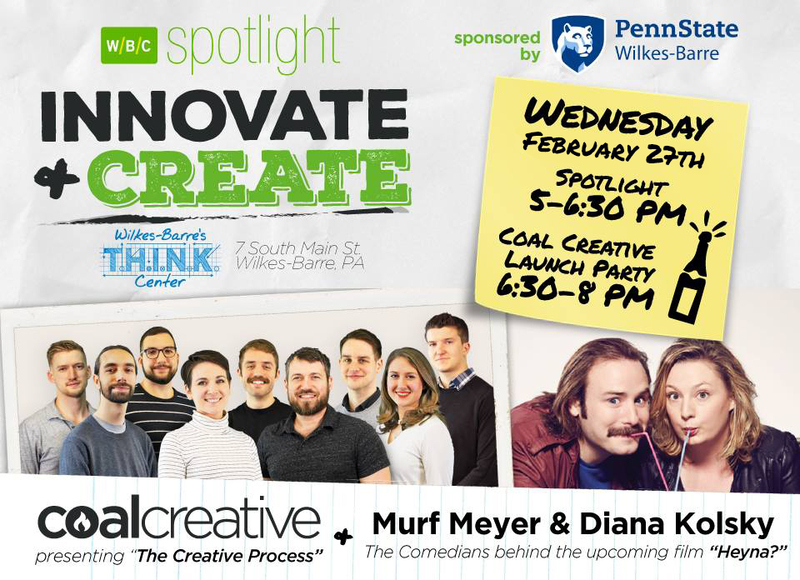 Join us on Wednesday, February 27th from 5-6:30 PM for our very first Spotlight event of 2019, featuring a special launch party for Coal Creative! Our featured speakers for the night are Murf Meyer & DianaKolsky, the comedians behind the upcoming film HEYNA? Our multi-video spotlight of the night is full-service creative agency Coal Creative, presenting "The Creative Process." Join Coal Creative from 6:30-8 PM for the launch of their new brand and some exciting announcements about their future planning! The Spotlight program features quarterly events that provide an opportunity for industry leaders and entrepreneurs in NEPA to meet, discuss, and identify potential partnerships. Each event features a fifteen-minute presentation from an entrepreneur with regional ties, as well as video spotlights featuring local entrepreneurs, students, and non-profits. Spotlight is a Wilkes-Barre Connect program coordinated by the Diamond City Partnership and sponsored by Penn State Wilkes-Barre, through the Invent Penn State initiative. Diana Kolsky, Screenwriter/Actor for HEYNA?, is a stand-up comedian and resident performer at the Upright Citizens Brigade Theatre in NYC who recently made Brooklyn Magazine?s list of ?Brooklyn?s 50 Funniest People.? She co-wrote and co-starred in the IFC series, Ménage à Trois with Diana & Murf. Diana appears in the feature films X Fest and Nerve, the short film Pet Monkey, The Chris Gethard Show on truTV, the Sundance Lab finalist pilot, Evolved, and various projects for Comedy Central, Funny or Die, and ESPN. Murf Meyer, Screenwriter/Actor for HEYNA?, is a veteran entertainer born and reared in the Commonwealth of Pennsylvania whose comedic stylings have been recognized by several top-shelf publications, like Rolling Stone, Newsweek, Penthouse, and The A.V. Club, to name a few. Murf?s TV and film credits include Broad City, Late Night with Seth Meyers, Friends from College, Younger, The Chris Gethard Show, How to Be Single, commentary for The MLB Network, voice acting for Nickelodeon, and live performances at Bonnaroo, SXSW, and Comic-Con. The Wilkes-Barre Connect program helps businesses grow in NEPA. Powered by the Greater Wilkes-Barre Chamber of Business & Industry, Connect features partnerships among the Small Business Development Center at Wilkes University, the Diamond City Partnership, the Institute for Public Policy & Economic Development at Wilkes University, Ben Franklin Technology Partners of Northeastern Pennsylvania, the Family Business Alliance at Wilkes University, and the Allan P. Kirby Center for Free Enterprise and Entrepreneurship at Wilkes University. Wilkes-Barre Connect is housed in Wilkes-Barre?s T.H.I.N.K Center, a space made possible by the Invent Penn State initiative.